I have been trading stocks for over 40 years. And yet mistakes are often made despite the years of experience. Just when one thinks things are going fine, something happens that humbles the trader. It is with this background that I relate a recent trading experience as a lesson we can all learn from. Earlier in the year the stock Red Hat, Inc. (RHT) was traded for a 28% profit (as shown on the Fusion Track record at RadioActiveTrading.com). But after a market sell off it looked like a market opportunity to re-enter the position. RHT was purchased on 3/28/2018 for $145. A put option was also purchased following the rules in The Blueprint to create a Married Put for safety. RHT rose soon after the purchase into the 150’s and then shot up to the 160’s. The put was sold as it still had some time value, and my thinking at the time was that RHT would continue to rise. To provide an additional ‘hedge’, I sold an OTM call to generate income and lower the cost basis. But the stock continued to rise and soon was in the $170’s. The sold call had to be rolled up several times. The call was rolled up and out in time for a small credit or small debit, so the overall profit was not impacted too much. So, although the call was rolled, it seems this was a brilliant investment at the time. Earnings were to be announced on 6/21 after the close. Earnings were growing at the 20%+ rate and were expected to continue at this pace. One of the talking heads on Mad Money lauded the growth rate and recommended the stock. When RHT went into the mid 170’s, it looked like the covered call insurance was just limiting the upside gains. And with earnings coming out shortly buying back the call looked attractive to leave the upside open for the next great earnings announcement. The downside would be protected with a mental stop. After all there was almost a 30-point gain already and plenty of room to sell if earnings were not as anticipated. RHT @ $165.73 -3.49: Thursday , after the close, reported fiscal Q1 net income of $113.2M. On a per-share basis, RHT said it had net income of 59 cents. Earnings, adjusted for one-time gains and costs, came to 72 cents per share. The results exceeded Wall Street expectations. The average estimate of 15 analysts surveyed by Zacks Investment Research was for earnings of 68 cents per share. The open-source software company posted revenue of $813.5M in the period, also beating Street forecasts. Twelve analysts surveyed by Zacks expected $807.3M. For the Q2 ending in September, Red Hat expects its per-share earnings to be 81 cents and revenue in the range of $822 million to $830 million for Q2. Analysts surveyed by Zacks had expected revenue of $856.2M. After hours the shares are down 20 points or 12%. As indicated in the announcement, the results for Q1 were better than expected. But in the 3rd paragraph of the announcement there was a forecast a weaker Q2. 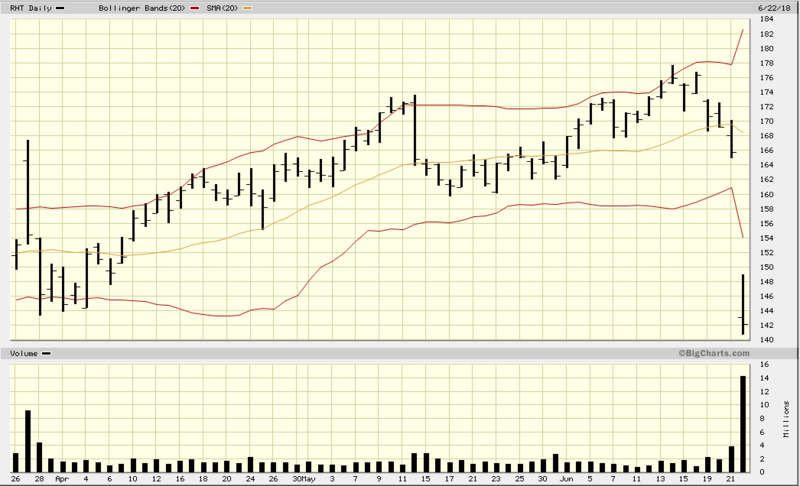 On Friday, RHT sold off to $142.14, down -$23.59 or -14.2%. The gains of the last 3 months were completely wiped out. That mental stop was useless since RHT opened at $143 with little chance to exit. Had I had a true stop order at $145, or even $150 or $160 – all would have been violated and I would have been closed out at the open price below $145. Hard stop orders and mental stops are ‘assumed insurance’ around a major event. In one day, the position went from a brilliant trade to a stupid move. The once 30-point gain went to a 4-point loss. What went wrong? Over confidence and arrogance was the source of failure. Each time a large decline like this is experienced it is generally due to over confidence. In fact, when one feels that rush of excitement of a great trade and brilliant move – LOOK OUT! This might be an early warning sign of danger ahead. It is important to have the discipline to think safety first, beyond a mental or even a hard stop order. Not necessarily from a stand point of fear, but caution that the market can be cruel and punishing in the event of a surprise. Enter hard fast protection in anticipation of some unknown event, especially when earnings are due. Not just some soft silly mental stop. A low cost, short term Put would have won the day in this case instead of trading on overly optimistic greed. Learn from your mistakes and become a better trader. Experience may be necessary, but not sufficient. Discipline is needed to protect positions from unforeseen events. How can you properly insure trades and not get hurt using a mental stop or stop order? Click HERE to Get The Sketch – a 9 page white paper that introduces the proper way to limit risk on your stock positions. Just enter you name and email and click Get the Sketch! Do you have an unrealized gain in a stock with Earnings coming up? Check out the Insurance tool on PowerOptions (you can register for a 14 day free trial HERE – no credit card or billing info required!). The Insurance tool will show you which put strike will give you the best protection based on your cost basis – and show you how to lock in most of those gains ahead of earnings…AND…leave the upside open! Looking for another way to play Earnings? Options give us…Options! I could have taken the profit on RHT off the table, and used the proceeds to enter a near term straddle prior to the earnings that would have added more profit…even with the -14.2% decline! Click HERE to see our Introduction to Straddles for upcoming events.